On Wednesday, October 31, 2018, the Lord called his beloved angel Tonya Shanette Bland-Ward to her heavenly home. With her loving family at her side, she fought a good fight but realized that our God knows what is best for His children and followed His words to rest in His loving arms. 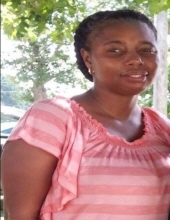 Tonya was born on December 23, 1975 in Farmville, Virginia to Gerald M. Bland Sr. and Martha A. Bland of Amelia, Virginia. She was baptized at a young at Amelia Baptist Church where she served as an Usher on Youth Sundays and attended Sunday School. Later as an adult, she transferred her membership to Gravel Hill Baptist Church where her Sunday School attendance continued. She graduated from Amelia County High School in Amelia, Virginia and went on to complete her associate’s degree at what is now Longwood University in Farmville, Virginia. Her passion however, was cooking. She allowed her love for cooking and experimenting with different foods to push her in excelling and earning a culinary degree from Virginia College in 2012. Soon after graduation, she became a Cafeteria Manager under the School Nutrition Program for Richmond Public Schools in Richmond, Virginia where she was employed until her heavenly departure. There were many days in which school lunch felt like the home-cooked meals from back in the day but cooking for hundreds daily was still not enough for Chef Tonya, so she also became a private caterer. Making the events of her clients’ special through fulfilling meals from appetizers to desserts brought her great joy and pride. Tonya was a loving mother, dedicated daughter, supportive sister, faithful aunt, and loyal friend. Her favorite pastimes on the rare occasion that she was not in a kitchen was watching her son play basketball, talking sneakers with her daughter and niece, spoiling her nieces, hosting family gatherings, traveling to Pittsburg Steelers games with Marvin, and spending time with her closest friends. Tonya leaves to cherish her memory a daughter, Alizae Ward; a son, Khalil Ward and their father Shawn Ward; both parents, Gerald Bland Sr. and Martha Bland; one sister, LaJuanda Bland; one brother, Gerald Bland Jr. (Ashley); one brother-in-law, Reuben Ward; three nieces, Taiya Cleveland, Essence Bland, and Erynn Bland; one nephew, Taylor Ward; a truly devoted significant other, Marvin Dodson, and a host of loving relatives and loyal friends. Tonya may be viewed by the public on Friday, November 9 from 10:00 am until 8:00 pm at Michael W. Hawkes Funeral Home. Funeral Services will be held Saturday, November 10, 2018 at 12:00 Noon from Amelia High School. Interment in the Craft Family Cemetery, Burkeville. in lieu of flowers, please make donations to the Tonya Bland Memorial Fund at any Wells Fargo Bank for her children. To plant a tree in memory of Tonya S. Bland-Ward, please visit our Tribute Store. "Email Address" would like to share the life celebration of Tonya S. Bland-Ward. Click on the "link" to go to share a favorite memory or leave a condolence message for the family.